While no concrete commitment has been formed, note that the idea of roadtripping has garnered a mutually-recognized level of excitement from all parties involved. Stage 3: The Planning Slough. This is the part that all road trip novices tend to dread–the actual planning of the actual road trip. This stage does not require example nor explanation: often, trying to solidify plans is as pleasant as watching the fat from a pot of soup solidifying at the very surface, and every once in a while you have to skim across it to scrape off the melty gooey icky stuff. Keep a master list of all the things you NEED for your trip tacked somewhere visible, like on your fridge. This master list should include things that you need for every road trip (toiletries, bedding, changes of clothing, camera). My master list is filled in particular with our favorite snack items, such as Oreos, Golden Oreos, things made from Oreos (cough these cookies), and Wheat Thins. Distribute responsibilities among all parties of your road trip, according to each person’s interests/strengths. For example, I really enjoy searching for best lodging deals, so hotel bookings usually fall to me–but I would never voluntarily deal with things that are car-related (gas, maintenance, driving), so I usually leave that to somebody else. Make the most enjoyable tasks a group effort. My friends and I all LOVE the food planning aspect of road trips (surprise surprise), so we usually hit up Von’s a day or two before the trip as one big group and still manage to figure out last-minute logistics at the same time. Two birds, one stone! While you’re shopping at places such as Von’s, record all of your road trip essential purchases and enter to win a car via The Best Road Trip Ever Sweepstakes, because what could make planning any more awesome than roaming around in a shiny new vehicle? Stage 4: The 18-Hours-Before-Departure Chaos. You know the drill: fire, chaos, running around frantically trying to find your razor and privately cursing yourself for playing Mario Kart until 3 AM last night instead of packing. To be fair, the rest of your party is doing exactly the same thing. The mayhem in this stage can be mitigated with my Stage 3 planning tips (see above). Stage 5: The Road Trip YAYS. So you’ve successfully managed to survive road trip pre-planning, planning, AND the 18-hours-before-trip mayhem stages without killing each other or eating all of the available snacks (or, if you did eat them all, you had enough foresight to buy more before your ride arrived)? CONGRATS, it’s time to finally embark on your road trip!! I’m not quite ready yet to reveal where our next big road trip is taking us–in typical fashion, I’ll be saving that info for after the trip!–but you bet that at least one will be happening before year’s end, and I can’t wait to share it with all of you soon. 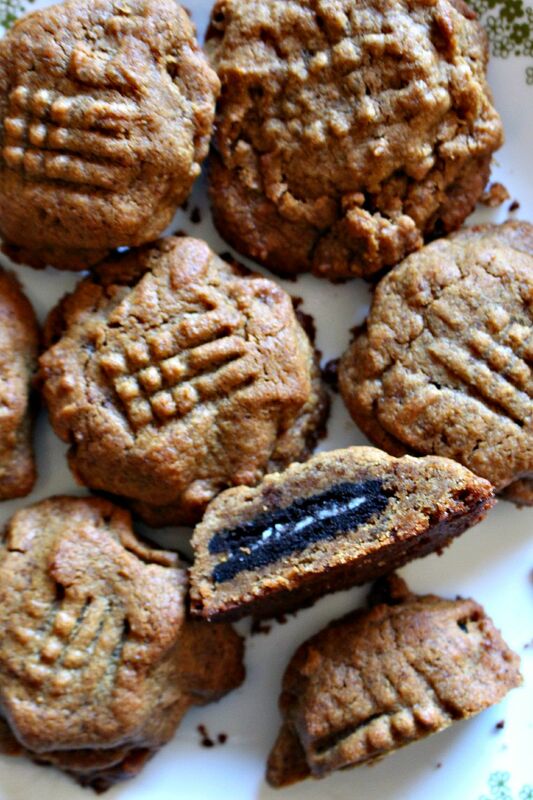 In the meantime, I have a whole dozen of these Oreo-Stuffed Peanut Butter Cookies sitting in my kitchen, waiting for me to road trip my hefty stomach over to devour them. My family tried them and said that they were DELICIOUS–and let’s face it, who ever doubted it, right? So make sure you make these to munch on while you’re planning your next big excursion! Where would you road trip if you could go ANYWHERE? Don’t forget to enter The Best Road Trip Ever Sweepstakes! 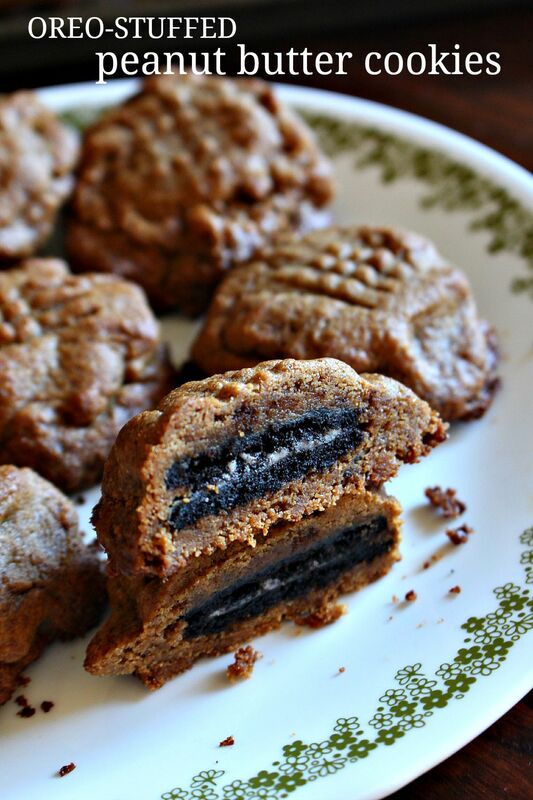 No road trip is complete without Oreo-Stuffed Peanut Butter Cookies! 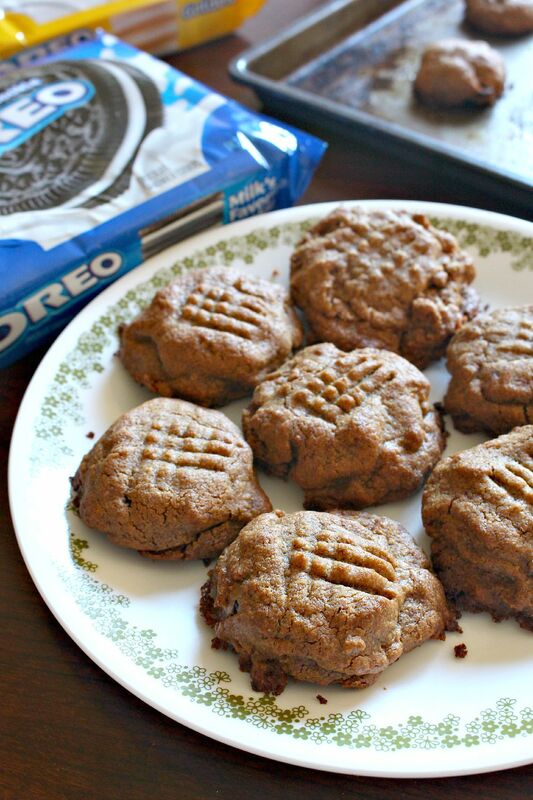 This recipe amps up my favorite flourless pb cookie recipe with a whole Oreo stuffed inside each cookie. They're one of the easiest cookies to make with maximum WOW and transportability factor! In a large mixing bowl, cream together sugar and peanut butter. Mix in eggs and vanilla. Using your hands, wrap a ball of dough around a whole Oreo cookie, making sure to seal in all sides until the Oreo is completely covered. 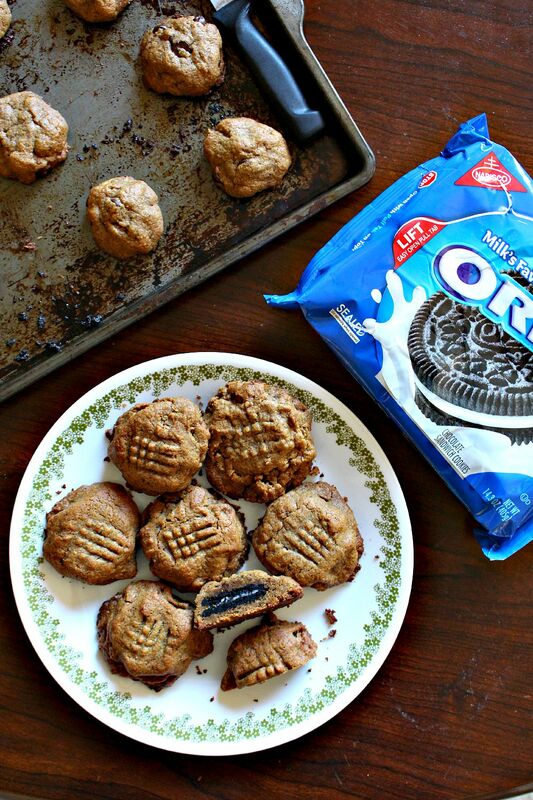 Place ball onto prepared cookie sheet and repeat until you have used up all of the dough and Oreos. Bake in preheated oven for 12-15 minutes, until cookies have just set. Remove sheet from oven and place on stovetop to cool (the cookies will continue to "bake" a bit on the stovetop). Cool completely, pack away, and enjoy on the road (or as you plan)! Naw, a donut-propelled jetpack would never work — we’d all keep eating the fuel! Can’t believe it’s almost Labor Day. Anyway, I’ll put all that out of my mind my contemplating these wonderful cookies. Good job! Thanks. haha! I hadn’t thought of that–I suppose we’d just need to keep a lot of extra fuel on hand, then! Thanks for stopping by–have a great week, John! 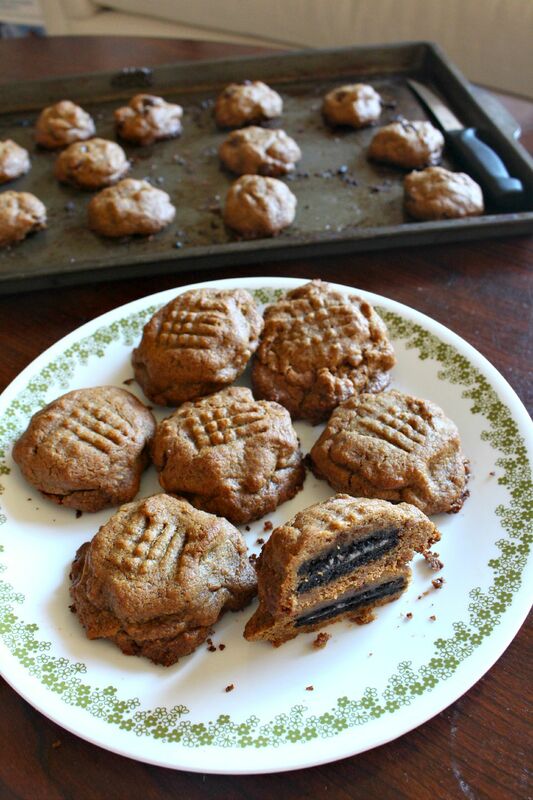 Ala, these cookies are the bomb! 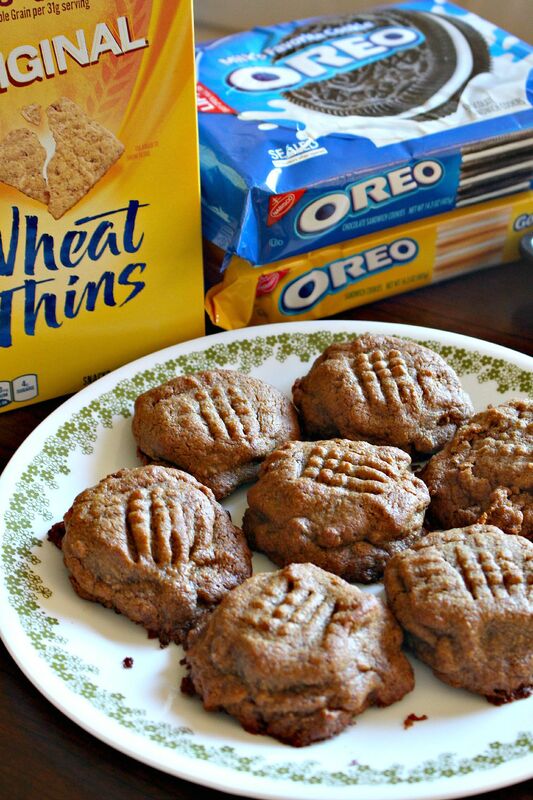 love anything with oreo in it. And road trip? The hubs has been talking about it and your tips make the planning sound easy. Now I’m excited for road trip, but first…cookies! ooooh yes, are you and the hubs driving down this month or flying? Road trips are the bestttt! Thanks, Linda!